Neuromuscular and cardiovascular diseases are active areas for application of CRISPR-Cas9 targeting to query the role of targeted mutations in recapitulating or correcting features of the analogous human genetic defects in vivo in live animals. Recently, porcine zygote injection with Cas9/sgRNA resulted in the generation of a piglet with muscular dystrophy (1). The piglet exhibited degenerative skeletal and cardiac muscle, potentially modeling symptoms of human muscular dystrophy (1). The CRISPR-Cas9 system has also been used to generate a rat model of Duchenne muscular dystrophy (2). Mutated rats exhibited a decline in muscle strength, and the emergence of degenerative phenotypes in skeletal muscle and heart. The mutations were heritable by the next generation, and F1 male rats exhibited similar phenotypes in their skeletal muscles (2). In contrast, Exon 23 deletion by CRISPR-Cas9 in the dystrophin-deficient mdx mouse resulted in expression of the dystrophin gene, partial recovery of functional dystrophin protein in skeletal myofibers and cardiac muscle, and significant enhancement of muscle force. (3) Others too have demonstrated that genome editing partially restores dystrophin expression in mice with muscular dystrophy (4, 5). Since many neuromuscular disorders results in gait and heart abnormalities, study of the heart and motor function in conditional mutant animals remains paramount to their validation as disease or therapeutic models. DigiGait and ECGenie, therefore, are efficient methods to validate the causal links between genotype and phenotype needed in pre-clinical models, and to identify potential off-target activity. 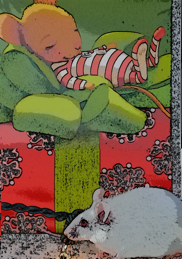 The ECGenie non-invasively monitors the heart in awake mice, from day 1 of life through death. It easily informs regarding arrhythmia, conduction defects, and heart failure. DigiGait provides metrics of strength, mobility, balance, and coordination in animal models of disorders that affect the ability of subjects to walk and run normally. DigiGait, for example, reports metrics of strength and force generation in animals with muscular-skeletal problems, including models of limb girdle muscular dystrophy, Duchenne muscular dystrophy, ossification of Achilles tendon (6), and Friedreich’s Ataxia (FA). DigiGait technology recently identified significant gait disturbances in the KIKO mouse model of FA providing phenotypic measures related to Friedreich’s ataxia clinical endpoints that could be used to test effectiveness of potential drug therapy (7). DigiGait, moreover, would quantify dystonia in mice with homozygous mutation of the VPS16 gene accomplished through CRISPR-Cas9 genome-editing (8). The ECGenie is now widely used to non-invasively record the ECG in awake mice. It has demonstrated, for example, autonomic nervous system abnormalities in modulation of the heart in mdx mice (9), as well the d-sarcoglycan deficient hamster model of limb-girdle muscular dystrophy (10). It would most certainly report the electrocardiographic disturbances in mice with PRKAG2 cardiac syndrome (11), and it would most certainly demonstrate the effectiveness of CRISPR/Cas9 genome editing to treat the PRKAG2 cardiac syndrome in mice, to show the power of the technology to characterize dominant inherited cardiac diseases resulting by disrupting disease-causing mutations. Advances in genome-editing techniques such as CRISPR/Cas9 will bolster the generation of genetically modified live animals that will more closely resemble the disease-causing mutations and recapitulate pathological features of human conditions. Mouse Specifics, Inc. non-invasive gait and heart monitoring technologies will rapidly characterize, early in life, the many models of neurodegenerative, neuromuscular, and cardiovascular diseases resulting from targeted gene editing methods and technologies. Yu HH et al. Porcine Zygote Injection with Cas9/sgRNA Results in DMD-Modified Pig with Muscle Dystrophy. Int J Mol Sci. 2016;17(10). Nakamura K et al. Generation of muscular dystrophy model rats with a CRISPR/Cas system. Sci Rep. 2014;4:5635. Nelson CE et al. In vivo genome editing improves muscle function in a mouse model of Duchenne muscular dystrophy. Science. 2016;351(6271):403-7. Long C, et al. Postnatal genome editing partially restores dystrophin expression in a mouse model of muscular dystrophy. Science. 2016;351(6271):400-3. Xu L et al. CRISPR-mediated Genome Editing Restores Dystrophin Expression and Function in mdx Mice. Mol Ther. 2016;24(3):564-9. McMackin MZ et al. Neurobehavioral deficits in the KIKO mouse model of Friedreich’s ataxia. Behav Brain Res. 2017;316:183-188. Cai X et al. Homozygous mutation of VPS16 gene is responsible for an autosomal recessive adolescent-onset primary dystonia. Sci Rep. 2016;6:25834. Chu V, et al. Electrocardiographic findings in mdx mice: a cardiac phenotype of Duchenne muscular dystrophy. Muscle Nerve. 2002; 26(4):513-9. Hampton TG, et al. Developmental Changes in the ECG of a Hamster Model of Muscular Dystrophy and Heart Failure. Front Pharmacol. 2012;3:80. Xie C et al. Genome editing with CRISPR/Cas9 in postnatal mice corrects PRKAG2 cardiac syndrome. Cell Res. 2016; 26(10):1099-1111.